Before I returned “The Boys in the Boat” to its owner, I had to go through the book and undo a handful of dog-eared pages — signs of a good read. I want to share one passage that speaks to the aesthetics of rowing while also giving a glimpse of the skills of author Donald James Brown, a writer with connections to both California and the Northwest (details below). “But the greatest paradox of the sport has to do with the psychological makeup of the people who pull the oars. Great oarsmen and oarswomen are necessarily made of conflicting stuff — of oil and water, fire and earth. On the one hand, they must possess enormous self-confidence, strong egos, and titanic willpower. They must be almost immune to frustration. “Nobody who does not believe deeply in himself or herself — in his or her ability to endure hardship and to prevail over adversity — is likely even to attempt something as audacious as competitive rowing at the highest levels. The sport offers so many opportunities for suffering and so few opportunities for glory that only the most tenaciously self-reliant and self-motivated are likely to succeed at it. And for those who appreciate the story behind the story, here’s an interview with the author on the PowellsBooksBlog. Recently, I felt a need to take a break from the world of nonfiction so I asked Facebook friends to recommend some light fiction. It’s the inspiring story of nine young men from small towns in Washington state who, with little or no previous experience, came together on the rowing team at the University of Washington and competed in the 1936 Berlin Olympics — and triumphed against the world’s best. 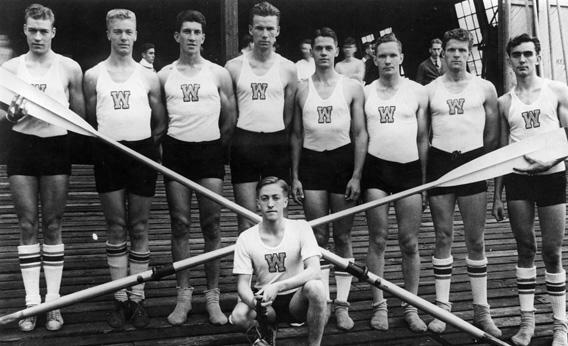 The 1936 University of Washington rowing team, including Joe Rantz, second from left. That these working-class sons of loggers, farmers and shipyard workers could learn a demanding sport and then rise to become collegiate champions, defeating the traditional East Coast powers as well as their West Coast archrival, the University of California, was astounding enough. That these eight oarsmen and their crafty coxswain could prevail in the Olympic Trials at Princeton and then win the gold medal – as a dejected Adolf Hitler watched – was even more improbable. That they accomplished this feat during the depths of the Depression and gave weary Americans reason to cheer – well, that was downright heart-warming. I know as much about competitive rowing as I do the inner workings of a nuclear reactor. What I learned from the book was plenty – not just about the origins of the sport and its enduring popularity amongst the upper class, but also about the techniques, teamwork and strategy that propelled these unlikely working-class heroes to victory. The author was moved to write the book when he met one of the crew members, Joe Rantz, in the twilight of his life. Rantz may have been the poorest of the whole bunch, growing up essentially on his own after his father and stepmother abandoned him while he was still in high school. Yet, as a crew member, he was like everyone else – essential to the team’s group success and utterly anonymous as an individual. Aside from the narrative itself, I enjoyed three things about the book. 1. Frequent geographical references to places I know, which allowed me to better appreciate key events. 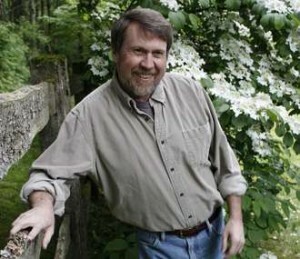 — Sequim, Washington, is a little town on the Olympic Peninsula where Joe Rantz grew up in abject poverty. Lori and I visited for the first time last year and drove the same streets mentioned in the book. — Poughkeepsie, New York, was the site of the Intercollegiate Rowing Association championship for much of the 20th Century. Likewise, I could visualize the stretch of the Hudson River where the crews battled, having seen it during visits to Poughkeepsie’s Vassar College, where our daughter did her undergraduate work. 2. 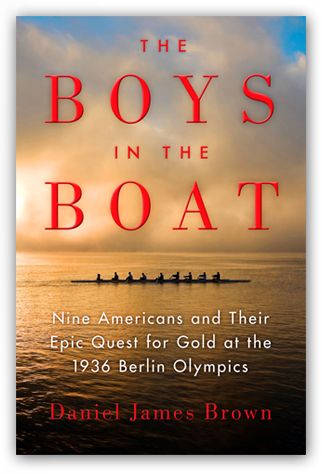 The author’s ability to provide historical context, whether describing Depression-era Seattle, the rise of the Nazis, the rivalry between the UW and Cal crews and their coaches, or the immense popularity of rowing itself. I hadn’t realized that it is the oldest intercollegiate sport in America, that for decades it was the most popular college sport, nor that millions of Americans huddled by their radios to hear live broadcasts of the Olympic races for the first time in 1936. 3. The story within the story. That is, the incredible determination required of Joe Rantz and his crewmates to tolerate pain and frigid Northwest weather during their training sessions on Lake Washington – and the amazing resiliency they showed in overcoming each and every barrier put before them, ultimately beating the steepest odds as 75,000 spectators watched the Olympic finals. I wouldn’t have found this book on my own, so here’s a shout-out to my friend Eric Wilcox, who’s rowed in Portland’s dragon boat races and who insisted I borrow the book after we had breakfast on a recent Saturday. Good call, Eric. It was a fine read. 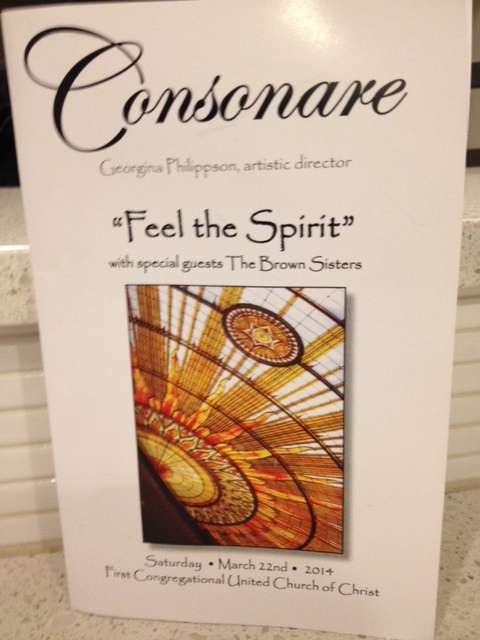 Saturday was an evening for spirituals and gospel music, courtesy of Consonare Chorale, the coed choir that Simone has been singing with for a few years. The program featured 11 selections by the 45-member choir, sandwiched around a four-song set performed by The Brown Sisters, a trio of Portland-born siblings who sing with heart and soaring melodies. The 11th song was a stirring collaboration between the choir and Dorcas Brown Smith, lead vocalist for the Sisters. Between Lori and me, Kyndall, Nathan and Sara, and our friend Molly, we nearly filled an entire pew at First Congregational United Church of Christ in the South Park Blocks. Though I can’t sing a lick and can’t read a note, I appreciate that we’ve broadened our musical horizons through our daughter. She took to the piano and violin at a young age, and has always loved to sing as a member of youth, high school and college choirs, and now with a select community group. Seeing Simone on stage is always a thrill. And it’s nice when we can celebrate her performances afterward with good food, easy conversation and plenty of laughter. Everybody, it seems, loves Hall and Oates, the childhood friends from Philadelphia who fashioned a career that spanned four decades and won them pop and R&B fans from multiple generations. Not everyone, though, is familiar with “Live From Daryl’s Place,” the free Internet show that Daryl Hall started in November 2007. Took me a while to find it myself after stumbling across an episode or two on YouTube. The show also airs on an obscure cable network (Palladia). The concept is simple: Each week, Daryl invites a guest artist to join him and his house band at his place in Millerton, New York. a village of fewer than 1,000 people near the Connecticut border. Guests range from the old (like Smokey Robinson, Joe Walsh, Shelby Lynne and Billy Gibbons from ZZ Top) to the newer (Grace Potter and the Nocturnals, Diane Birch and the Plain White Ts). Guests will collaborate with him on an old Hall and Oates song and then he’ll return the favor by joining in on some of their songs during the half-hour episode.. The results are very cool. I could be predictable and share videos of my favorites — Grace Potter, KT Tunstall, Fitz and the Tantrums — but for the sake of variety here are three performances i particularly liked. If you have broadband service, consider yourself fortunate. According to a report in The Washington Post last year, 2.5 million people still use AOL dial-up — about 2.2 percent of U.S. households. Many AOL users live in rural areas where broadband isn’t available. Others say they can’t afford the faster service. And still others apparently are asleep at the wheel, unaware they’re still paying the monthly service fee. Bridge separating Rosario Lagoon, left, from Cascade Lake. The idea was Lori’s. The details were left to me to work out dates and other logistics. 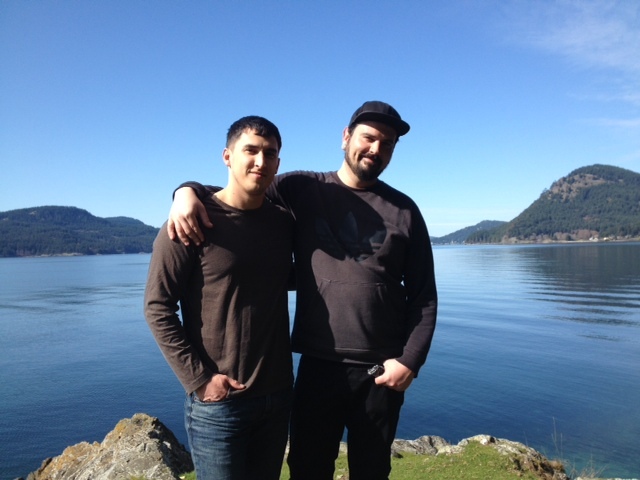 And so it came to pass over a period of three days last week: father-and-sons time on Orcas Island, with no agenda other than to relax and enjoy each other’s company. We’d never done it before. But we had so much fun, we agreed we’d like to do it again, hopefully with an extra day or two. Nathan and I drove up early Tuesday, caught the mid-afternoon ferry from Anacortes and arrived at our Eagle Lake cabin around 5:30 p.m. Jordan was already there, having gone up on Saturday with wife Jamie for a 3-day weekend and celebration of her birthday on Monday. She returned home to Spanaway the next day, leaving Jordan to wait for us. Nathan cooked the first of two delicious dinners that night, while I took care of breakfasts. We went out for only one meal – lunch at the Lower Tavern, known for serving the best burger on the island – and shot some pool before the food arrived at our table. Jordan, left, and George head to the shore at Obstruction Pass State Park. We took two hikes – one to Obstruction Pass State Park and another to Cascade Lake and Rosario Lagoon – both thoroughly refreshing and enjoyable. Other than that, we spent a lot of time reading, relaxing and listening to music before coming together at night for movies. The previous owner of the cabin left behind more than 200 VHS movies, so we’ve always had our pick of ‘80s and ‘90s flicks. Jordan and Nathan at Obstruction Pass State Park, with Buck Bay in background. The weather was perfect: sunny, cloudless and warm (mid to upper 60s). We did clean up around the property, as there were quite a few tree limbs down from a late winter snowstorm earlier in the month. 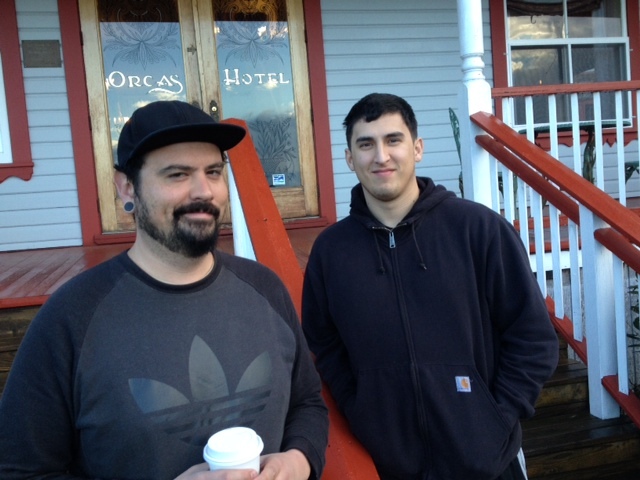 And Jordan and I did manage to make it down to Doe Bay Resort’s Open Mic night for about an hour Thursday, where we met up with Jennifer, a friend and fellow writer, and her son, Mo. Friday morning came all too soon. Had to rise early to catch the return ferry and get both boys back for their respective commitments that evening. Along with some fine photos, I brought back some nice moments for the memory bank. As a dad, it’s great to spend one-on-time with each of my sons (daughter, too, of course). It’s even better when you can be together and see the love and respect they have for each other. Nathan may be 33 and Jordan 26, but there’s still plenty of “boy” in both of them. Love those guys. A few weeks ago, an Internet wunderkind paid a visit to The Oregonian to share lessons learned as a startup founder and online entrepreneur. His remarks that day, coupled with my recent reading of his book, provided a shot of encouragement and a big heaping of context for the digital journalism that my peers and I are doing at the Oregonian Media Group. — Driven by a unique vision. — Unafraid to take risks. — Evangelistic in marketing his idea. — Opportunistic in establishing business relationships. — Generous in sharing knowledge and expertise. “Their” being parents, employers, competitors, whatever. 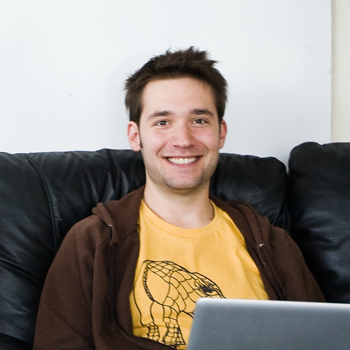 In Ohanian’s world, the world isn’t flat – the World Wide Web is. And by that, he means anyone with a computer and an Internet connection has all he or she needs to exercise their freedom to experiment, create and invent the Next Big Thing. There’s much more that makes up this book: several examples of successful startups like airbnb, DonorsChoose, Kickstarter; a discussion of attempts in Congress to pass legislation that threatened to undermine the free and open Internet; and lots of do’s and don’ts for those hoping to establish their own online company. 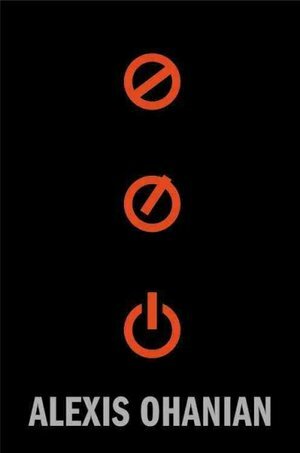 For someone who’s a good deal older than those who make up Generations X or Y – the young adults who’ve grown up in an online world – “Without Their Permission” is a fast, light and informative read. Not unlike the best websites and apps , I found it useful AND easy-to-use. If you instantly recognize the names Rob Ford and Rahm Emanuel, this post is for you. The mayors of Toronto and Chicago could not be more different, right? One, previously unknown outside his own metro area, became an overnight internet sensation last year when he admitted smoking crack cocaine. The other, a former congressman and White House chief of staff, was already widely known before winning election as the first Jewish mayor of the 3rd largest city in the U.S. 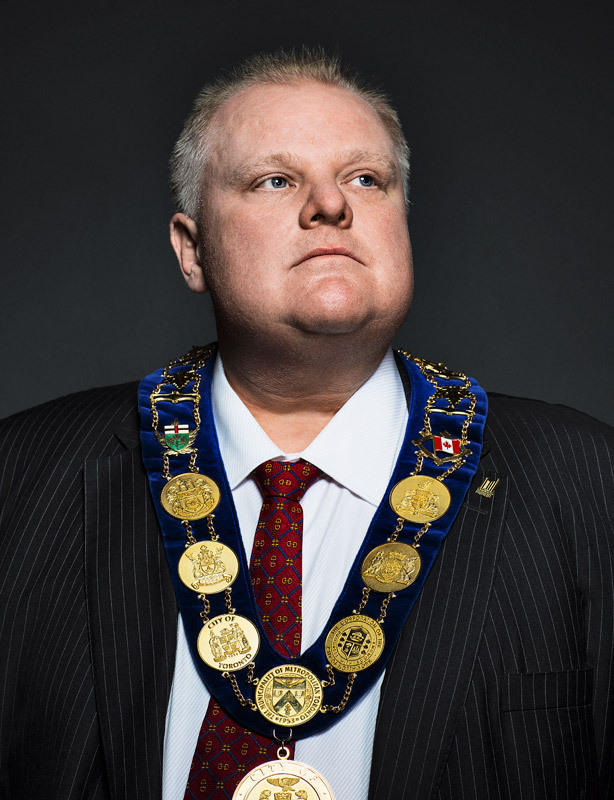 Even if you think you know these guys, Esquire’s got a great pair of political profiles of Toronto’s Rob Ford and Chicago’s Rahm Emanuel. Ford’s beefy stature and manic style recall the late great comic Chris Farley, but he’s not one to be underestimated. Ford is the consummate retail politician – the kind of guy who puts his home number out there and works the phones relentlessly trying to cut through the bureaucracy for his constituents. It might surprise you – as it did me – to know that Toronto is made up of six previously separate municipal entities, meaning the central city and five suburban communities, are now a single megacity. Ford hails from one of these suburbs, where the politics are more conservative than downtown, and as such he gives voice to the white working class as well as to many of the Asian immigrants who’ve moved to the outer edges of Canada’s second largest city. 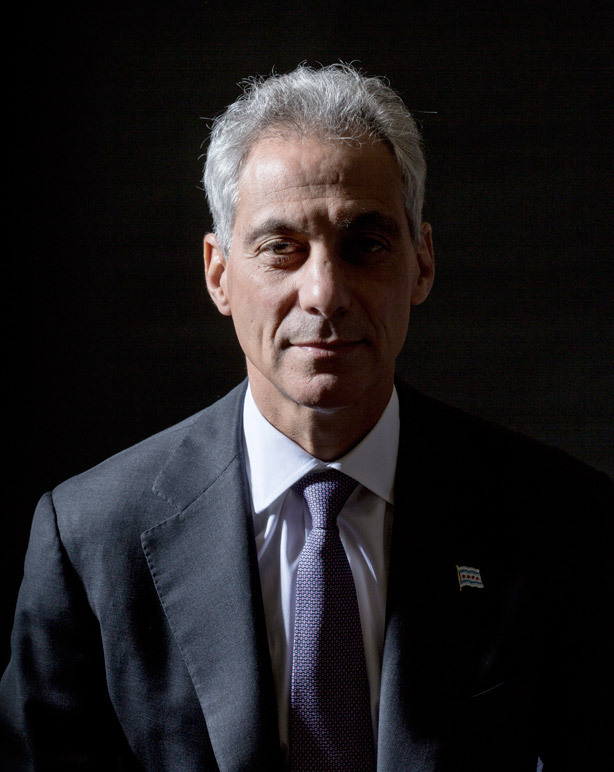 Emanuel, on the other hand, is the personification of smooth political operator, a fitness fanatic whose weight is said to fluctuate between149 and 150 pounds (yes, you read that right). The self-discipline he brings to exercise is identical to that which he brings to politics, working 7 days a week, from dawn to dusk, and running the Windy City in the same old-fashioned, bare-knuckles way as his predecessor, Richard M. Daley. Ford is up for re-election this fall, Emanuel not until next year. With his fundraising prowess and brilliant political skills, Rahm has got to be a shoo-in, despite currently high disapproval ratings. Anywhere else but Toronto, Rob would be road kill. But don’t be surprised if he wins another term. Next up, Neil Steinberg, describing Emanuel at a Walmart Neighborhood Market in a gritty, poor part of Chicago. An outsider witnessing this recent Saturday in the life of Rahm Emanuel might assume it is election time and he is campaigning. Only there is no campaign. The next Chicago mayoral election is February 24, 2015. He could stay hidden in City Hall, working the levers of power, and let his money—he’s already raised more than $5 million for the 2015 election—do his runny-nose wiping. But he doesn’t. Either because he loves people—his explanation—or because his disapproval numbers have never been higher, especially among black voters. He works seven days a week, a dawn-to-dusk whirling dervish, spinning like the dancer he once was, to assault the city’s problems. The gun-violence epidemic that has earned Chicago the top spot on the FBI’s murder rankings and headlines such as “the murder capital of America”; the ticking pension time bomb that could blow the whole place to kingdom come (or, worse, Detroit); the perpetually broken four-hundred-thousand-student school system in which more kids are shot each year than enter Ivy League universities, a funnel of failure in which, for every one hundred freshmen entering high school, six graduate from college: All come together in a veritable firestorm, one woe feeding the other, and his worst critics can’t say he isn’t trying to live up to LBJ’s famous dictum to do everything—everything possible—to succeed, though as recently as Christmas, Chicagoans thought less of Rahm Emanuel, clean-living fitness buff, beavering away at Chicago’s forest of woes, than the citizens in Toronto thought of their crack-cocaine-smoking mayor. I bought the award winning CD “Same Trailer Different Park” and now I’m hoping an upcoming tour will bring her to Portland. Nathan with Grandma Ora (my stepmother) during the Rede family reunion — July 2009 in Portland. The annual get-together is almost always held in California, and occasionally in Arizona or New Mexico. We managed to get a few dozen aunts, uncles and cousins up to the far north for the 33rd reunion.